The literal translation of the word Enoteca is ‘wine repository’ and it refers to an establishment that showcases the products of wine producers from a particular area as well as serving local food. Rabezzana is a vineyard in the Monferrato area of Italy that has been producing wine since 1911. A family business run by four generations of the eponymous family, they expanded to run a winery in Turin, where they now carry almost a thousand different wines (Italian and international). 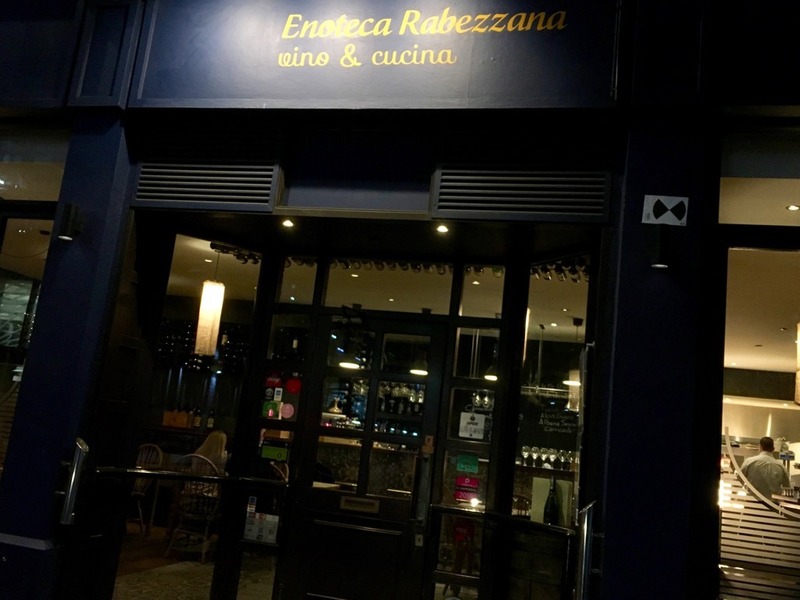 Enoteca Rabezzana in London sits opposite Smithfield Market, not an area particularly famous for its grape varieties or its terroir – but the restaurant showcases the wines from the Piedmont region of Italy. They have a list of 100+ wines with a focus on Barbera, Barbaresco and Grignolino DOCG. Frankly, I’m excited! 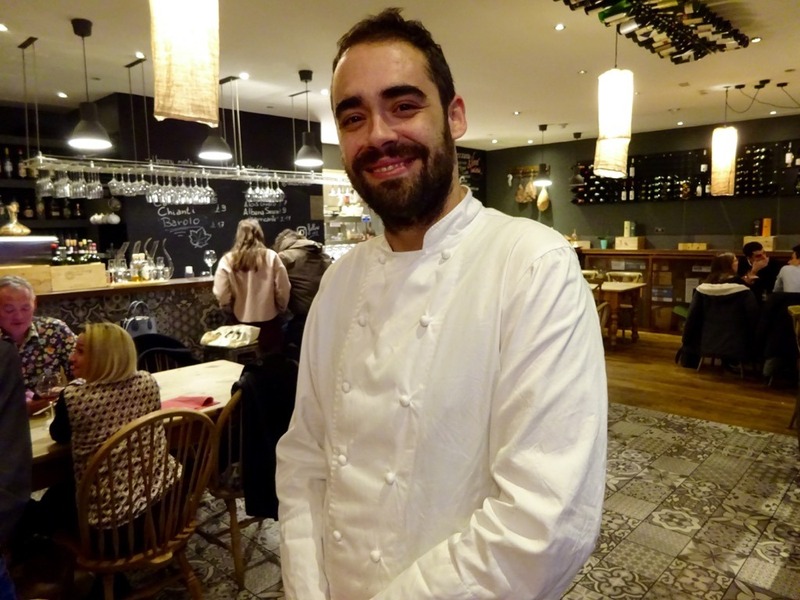 The kitchen at Enoteca Rabezzana is helmed by Executive Chef Federico Casali with the menu focusing on small plate Italian tapas, pasta dishes and cheese and meat boards alongside more traditional Italian mains and desserts. The interior has an authentically rustic Italian feel with charming floor tiles, simple wooden tables and chairs and wine bottles being creatively displayed through the room. We start proceedings off with a sumptuous glass of white with the lychee notes of Fondatori, Albano Secco 2016, Merlotta matching our starters beautifully. 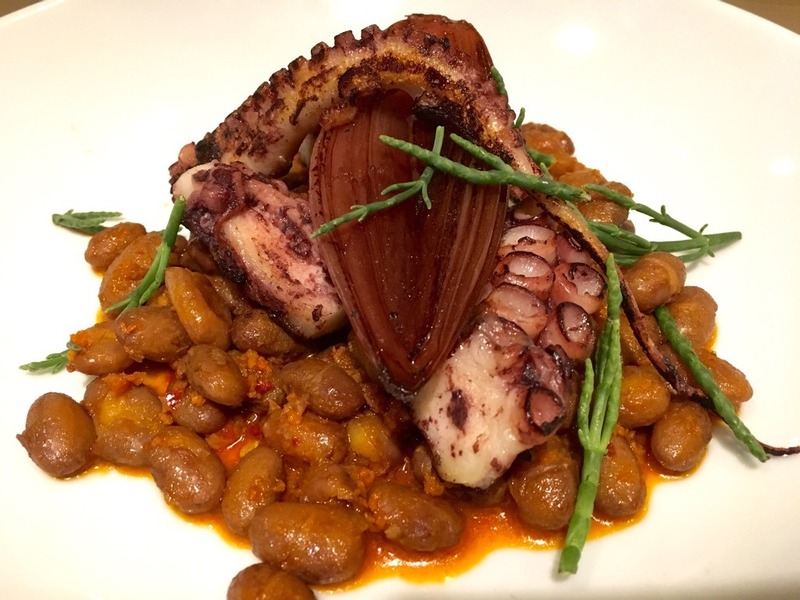 First out was a plate of tender, spicy grilled octopus which came with beans, nduja, and a meltingly soft shallot cooked in red wine vinegar. On a cold winter’s night, nothing could have been more welcoming – it was tasty, nourishing and warming. 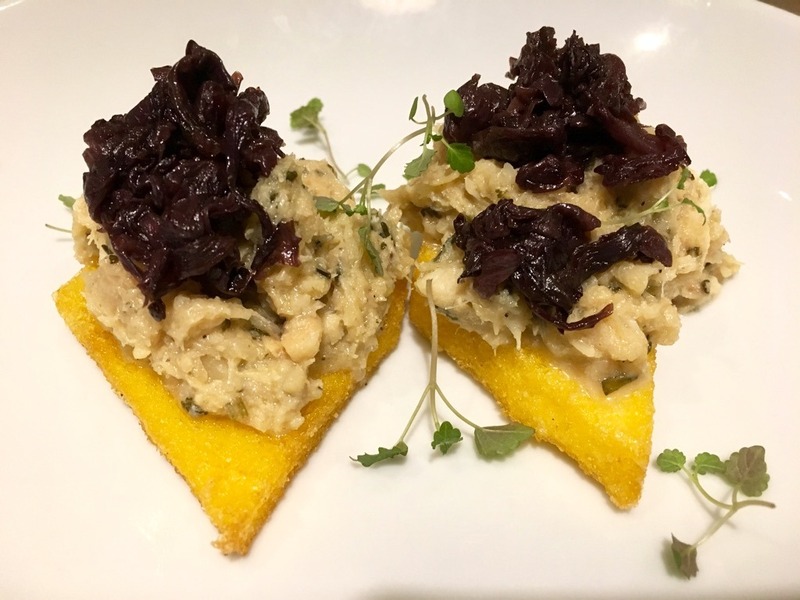 Salted dried cod (Baccala) was stewed and served with crisp, light diamonds of fried polenta with meaty mashed cod and confit red chicory. Again this was a dish that was not afraid of flavour. For our pasta dish, we moved on to a white from the Sud Tirol that was completely new to me. Our sparkling glass of Kerner Aristos, Eisackraler Kellerei, Cantina Valle Isarco had a well-controlled acidity and lime and greengage flavours that were fantastic with our plate of Tonnarelli pasta (a square-cut spaghetti) served with lime butter, red mullet and pistachio pesto. 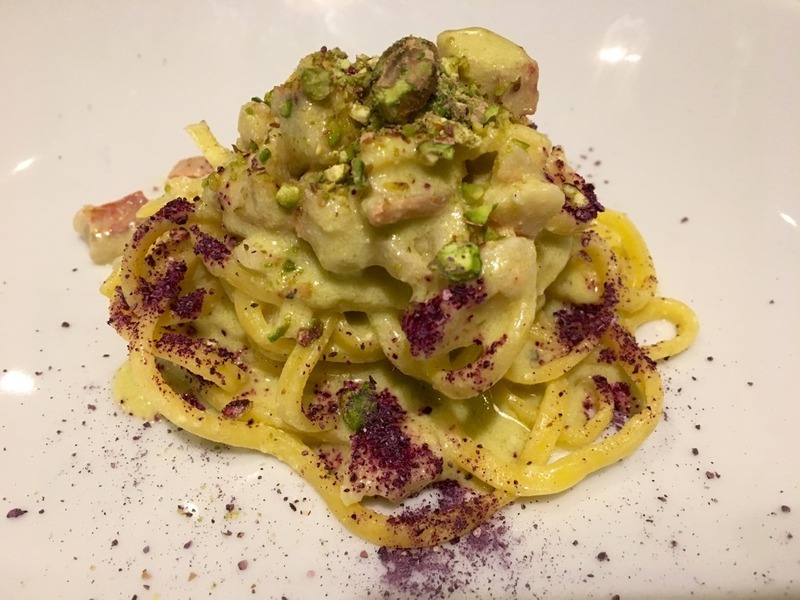 This was a really unusual and delicious new dish from the chef at Enoteca Rabezzana who told us that his inspiration came whilst drinking a Mojito…! The pasta was perfectly al dente slathered in a creamy, nutty sauce with the flavour of that great marriage of lime and red mullet at the forefront. I’m drinking reds much more with fish dishes these days but the flavour has to be fairly robust. 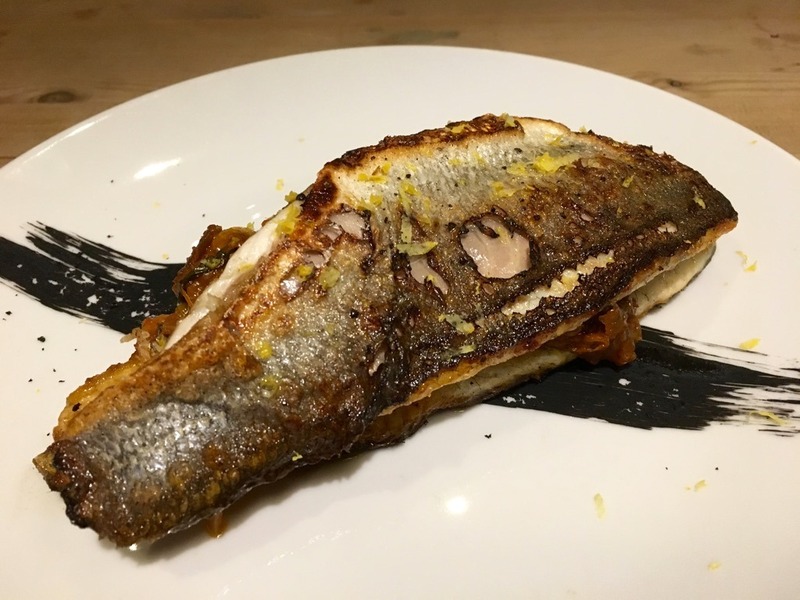 My grilled sea bass fillet had a hint of bitterness (in a good way) from its charred skin which contrasted with the sweetness of its flesh; and the red pepper flavours of the accompanying caponata were picked up in our Sardinian red, a full-bodied Cannonau di Sardegna 2014, Giovanni Cerchi. 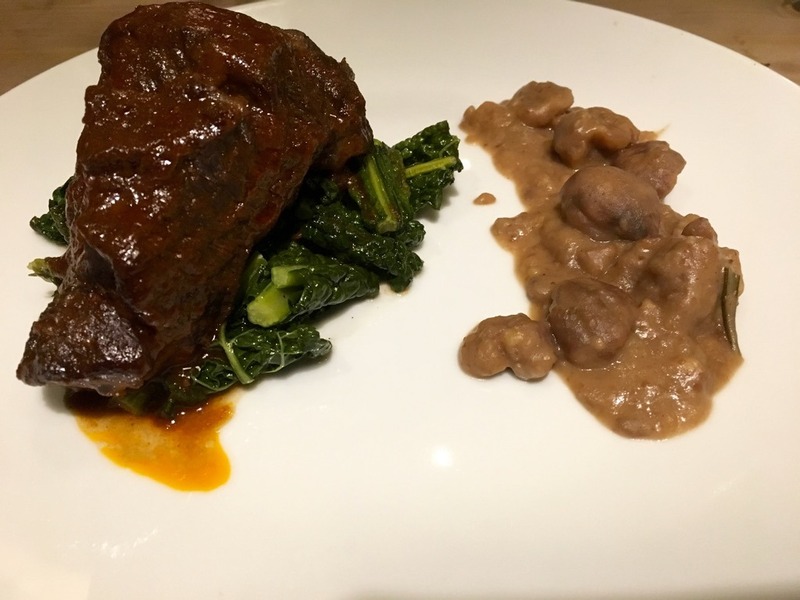 Braised ox cheeks had been slow cooked and were surprisingly light, falling into fibrous pieces off the fork with some delicious cavolo nero adding a bit of bite to the proceedings, and chestnuts with rosemary and black pepper adding a sweet/savoury addition. 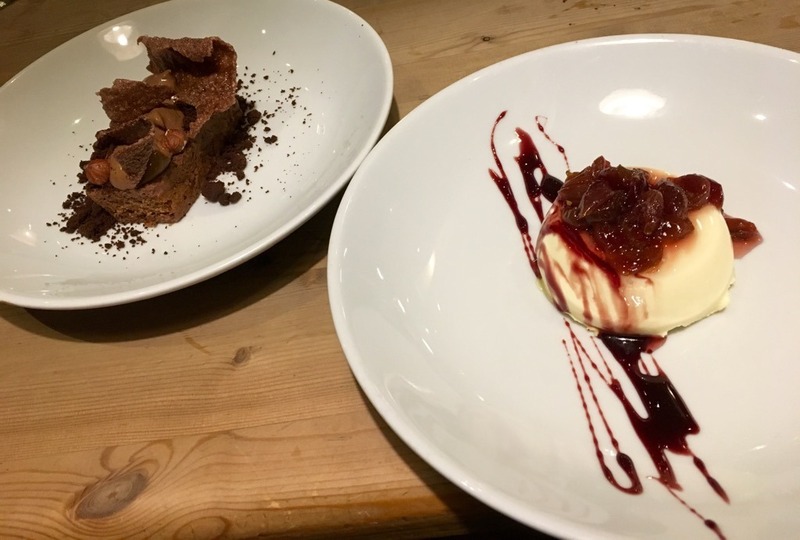 I wasn’t expecting too much from the desserts but a Pannacotta with a red wine reduction and grape chutney, made with milk and cream and flavoured with lavender was simply stunning and we also enjoyed the four textures of chocolate; chocolate sponge, mousse, chips and crumble. We sank an intense and raisiny glass of Passito Veneto Aldehheri from Valpolicella to help our pudding down! 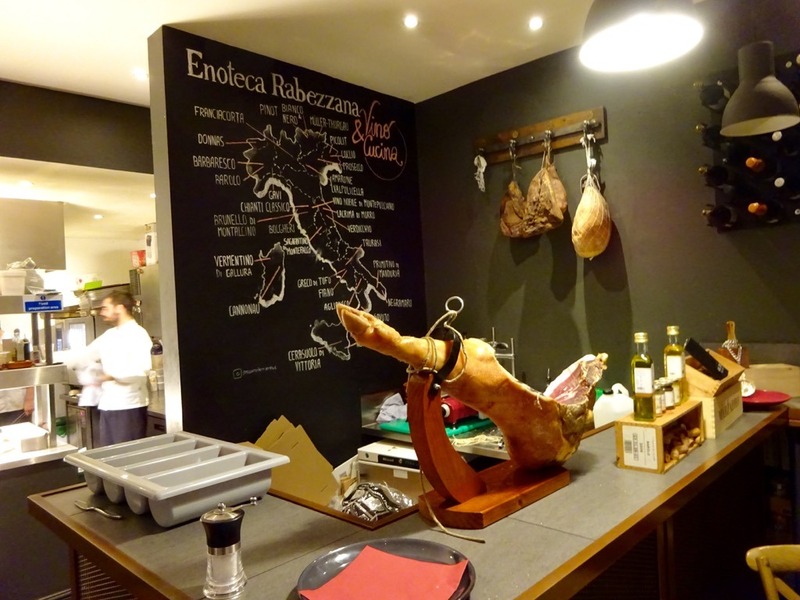 I loved Enoteca Rabezzana. It’s the sort of place that is very difficult to find with gutsy, rustic cooking done with a high level of precision. It shows a fundamental understanding of the ingredients, a strong technique and a high level of creativity. They have a young, highly skilled and committed team who are working really hard to make the project a success and deserve our support. I’ll be going back.